Two posts in almost as many hours? Must be Friday. You have my friend Rachel to thank for this – she’s spotted what she calls “the most hilarious photo I’ve seen all week. 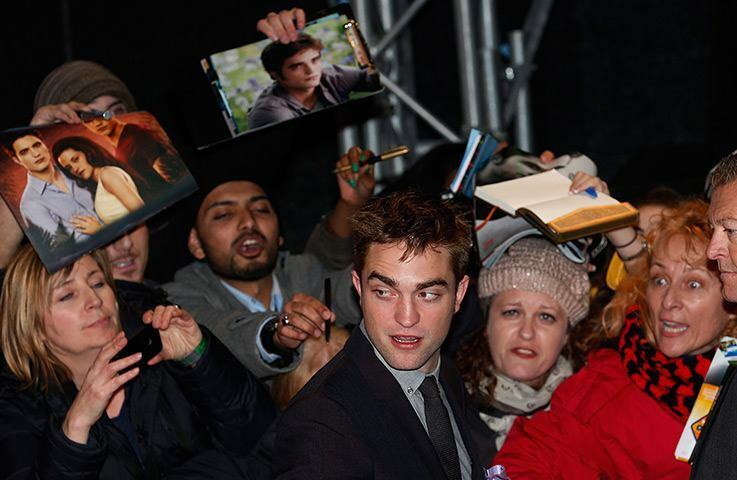 Is Mr Desperate-For-An-Autograph in the centre the best bit, or the middle-aged Crazy-Eyes on the far right?”. To which I’d respond well, yes, but what the hell is Noel Clarke doing there?!? I annoyed Joshua yesterday morning. Having promised him the night before that we’d spend the first part of strike day watching Doctor Who, we did just that – and then I promptly jumped up and switched off the TV before the ‘next time’ reveal. From his armchair, Joshua blinked. “Isn’t there a bit about the next episode?”. What I should have done at this point is lied to him. It would have saved an argument. It would have been a white lie, conscious of his feelings. But like a sleep-deprived idiot I told him the truth, figuring this might be a chance to teach an important lesson. The trailered episode in question is ‘Army of Ghosts’ – which, as anyone familiar with 2006 Who will tell you, is the first part of the fanboy pleasing (but utterly third-rate) Daleks / Cybermen grudge match. There are three twists in this episode: the first is that the eponymous and supposedly benevolent ghosts are actually Cybermen punching through holes in the universe; the second is the unexpected return of Mickey Smith; the third is the revelation of the Daleks (no pun intended), who are discovered inside a huge sphere in the basement. As I said before, it’s a rubbish episode, and the corresponding second part features an excruciating ‘reunion’ between a woman who is mourning her dead husband and a man who is mourning his dead wife – as well as the long and drawn-out departure of Billie Piper, and a needlessly overwrought farewell on a beach (Glamorgan, doubling for Norway). But none of that is going to matter to Josh, who is six years old, and who I’m convinced will get more out of it if he doesn’t know about the Cybermen / Daleks / Mickey return (and I know that even if he only sees the first of these, I’m going to get pressed for information until I give in, or put two and two together and twig that this is the Daleks / Cyberman match-up of which he’s heard me speak in the past). The notion of controlled leaking is something that’s infuriated me about Doctor Who ever since its return. The newspapers are spoon-fed information by the BBC in order to keep anticipation levels up and enthusiasm tangible, but it means any element of surprise is gone. Stories abound about the return of the Master, the on-screen demise of Kylie Minogue and, in the last series, “the death of a major character” (yes, I know how that came out, but I’d rather not have known at all). Even if you don’t actively look for these stories they’re still run as front page news and thus the only way to avoid them is to engage in a total media blackout during a show’s run, or learn how to avert your gaze. What irritates me the most is that Moffatt then has the audacity to complain about the revelation of spoilers. His anger is palpable and completely unjustified given the revelation-heavy direction the show has taken over the years. You can’t court the press and then expect the fans to play ball. I’m ambivalent when it comes to spoilers. It depends on the show. If it’s a programme I watch, I don’t want to know about it. It is a miracle that I managed to get through to the end of the final series of 24 having no idea, for the first time in years, as to how it ended, right down to the fate of the main character. I’d sworn that I’d stay dark, and by some miracle (given how much media I read over the course of the average day) I managed it. Conversely, I also know the ending of the final instalments of Lost and Prison Break without having watched a single episode of either. When it came to The X-Files, I simply got bored, giving up after series 7 and reading about the rest, as is customary, on Wikipedia. As is customary, Miles overstates his case, but up to a point he’s right – certainly with regard to the Moffatt-led era where the twist is of paramount importance, and the logic of stories is seemingly reliant on obscure details that were planted earlier in the season, obvious to no one but the writer. At the same time, I still want Joshua to experience things properly. There’s a difference between producing television where the twists are basically the whole point, and television where they add a certain oomph without taking over. I knew about the father / son revelation at the end of The Empire Strikes Back from playground chatter almost a decade before I finally saw the film, but I can’t help thinking that the emotional impact of this moment would have been far more powerful if I’d seen it as it’s supposed to be seen. When you actually get to that moment, even if you know what’s coming, it’s overwhelmingly powerful, simply because it’s the last thing you expect. Terminator 2 is another example. Its script was wasted on the audiences who flocked to packed cinemas in the summer of 1991, because the publicity for the film gave away its direction months before it was released. The first half hour has a clever, ambiguous narrative featuring the arrival of two Terminators (including one that we don’t even know is a machine), and the assumption of an audience familiar with the first film would be that Schwarzenegger’s character is once more the villain. It is not until the crucial first encounter between the two, and a two-way standoff that concludes with Arnold’s recommendation that John Connor should “get down”, that the Terminator’s allegiances are revealed – but by then, of course, we all knew anyway. When my wife first watched the film with me some fifteen years later, having missed out on the media hype the first time round, she was oblivious, and thus experienced this revelation with genuine and pleasing surprise, the way it’s meant to be. I was thus determined that Josh should find out about Luke Skywalker’s parental lineage the proper, old-fashioned way, and despite several close calls we managed it (“It just goes to show,” he sagely commented afterwards, “that you should never trust strangers. Or Darth Vader”). I’m overreacting, but sometimes it’s just nice to keep something back, and it’s a joy when you experience something genuinely unexpected. I can remember the jaw-dropping twist at the end of ‘The Stolen Earth’, where the Doctor appears for a moment to be regenerating – an ending that was kept completely under wraps and that led to an explosion of online and offline debate and speculation in the week leading up to its utterly underwhelming denouement (when Tennant channels the regenerative energy into his spare hand, which conversely grows into a ‘human’ Doctor, or at least half-human on his mother’s side). In a way, we ought to have seen it coming: the fact that such an apparent bombshell was kept so beautifully hidden from the press and the viewing public at large should, given the show’s normal processes, have served as a sure fire indicator that this wasn’t going to be a regeneration at all, and that Davies would come up with a pathetic get-out clause. As, indeed, he did. This stuff isn’t really a big deal, I know, but we’re so saturated with media now – trailers, adverts, previews, webcasts, magazine articles – and all the best stuff is played to death online and on previews a matter of days, and sometimes weeks before it’s screened. The X-Factor is a prime example of this, showing all its audition highlights in the ‘coming up’ segments that precede the many tedious commercial breaks, as well as leaking them to The Sun a couple of days before transmission, and therefore removing any sense of surprise and ensuring that you’re thoroughly sick of them. (I can remember a one-hour special starring Martine McCutcheon at the turn of the millennium when she spent most of her time between songs bigging up the duet she was going to do with Andrea Bocelli later in the show, with the net result that by the time it arrived, I no longer cared.) So I want to keep some things secret. And this is all well and good, but of scant comfort to the cross little person who, while all this was running through my head, was still sitting a few feet away from me. He’s probably too young for The Woman In Black. I will think about it.